The Movie Stars Rajkumar Rao, Sonam Ahuja, Anil Kapoor and Juhi Chawla. 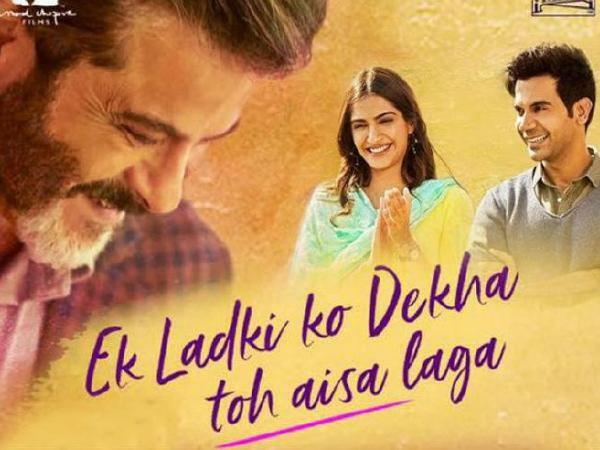 The Romantic Comedy Film Ek Ladki Ko Dekha Toh Aisa Laga, Directed by Shelly Chopra Dhar is a Slow kind of movie, but guess what, the movie keeps the audience attached to it, The film shows fair share of stereotypes to tell a modern story. The fact that it brings is a still niche subject like homosexuality, to a mainstream movie, Which is one of its strengths. The Story is not too good there but the Film is made in a way that you will not feel bored at all. But you have to follow the phrase that "There is no logic, Just a magic". Sahil Mirza (Rajkumar) meets Sweety (Sonam) in a manner a scene which is actually not needed in the film, Without any logic they meet in the film. The Screen Play is super weak, but the way the movie is shoot one will keep attached till the climax. Actors Work: Although all the actors are well groomed actors who gave years of their lives to the industry but Sadly except Raj Kumar Rao all the actors, are showing an impression of over acting in this move. Movie Ratings : 03/05. (A one time Watch Movie).